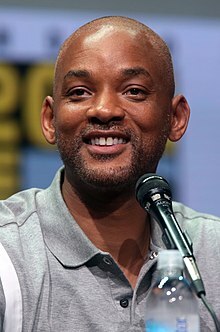 Willard Carroll "Will" Smith Jr. (ojoibi September 25, 1968) je osere, olootu, rapper, alawada ati ako-orin ara Amerika. Ni osu April 2007, Newsweek pe ni "osere to lagbarajulo ni Hollywood". Smith ti je yiyan fun Ebun Golden Globe marun ati Ebun Akademi meji, be sini o ti gba Ebun Grammy merin. ↑ "Will Smith Net Worth - atlantablackstar". atlantablackstar. Retrieved March 13, 2015. ↑ Essence (September 26, 2016). "Jada Wishes Will Smith a Very Happy Birthday, Thanks Him for Helping Her Change the World". Essence.com. Retrieved July 8, 2017. ↑ Sean Smith (April 9, 2007). "The $4 Billion Man". Newsweek. http://www.newsweek.com/2007/04/15/the-4-billion-man.html. Retrieved July 7, 2011. Àtunṣe ojúewé yi gbẹ̀yìn wáyé ni ọjọ́ 20 Oṣù Kẹ̀wá 2017, ni ago 18:11.